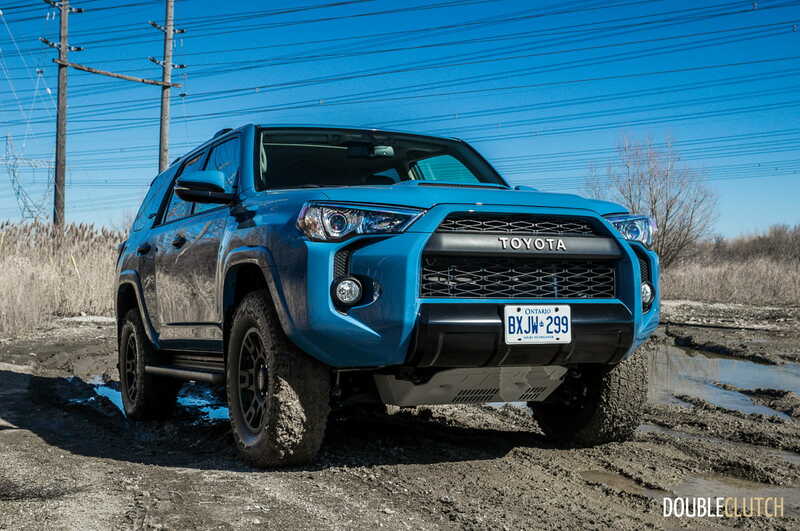 Badass homage to a classic rugged off-road truck. That just about sums up the 2018 Toyota 4Runner TRD Pro in a nutshell. 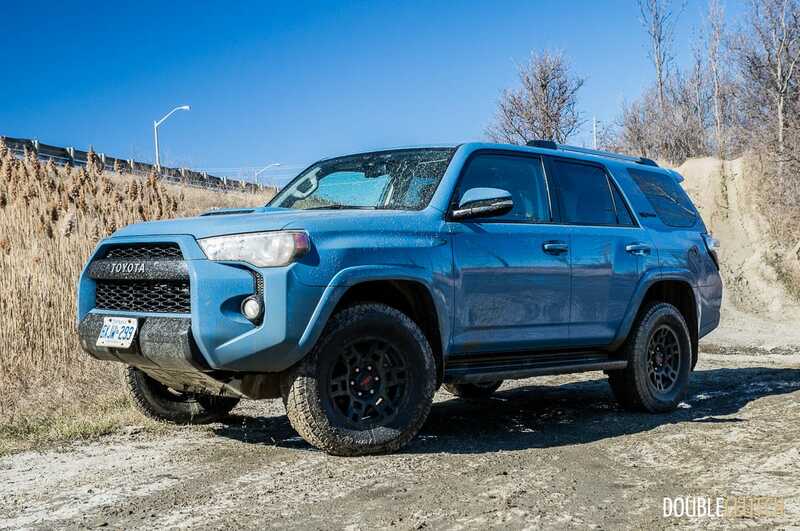 Take the existing 4Runner, which is already a capable off-roader and rugged sport utility with a cult following, and outfit it with even more Toyota Racing Development hardware to allow it to tackle rougher terrain. 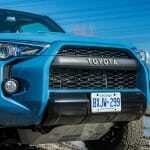 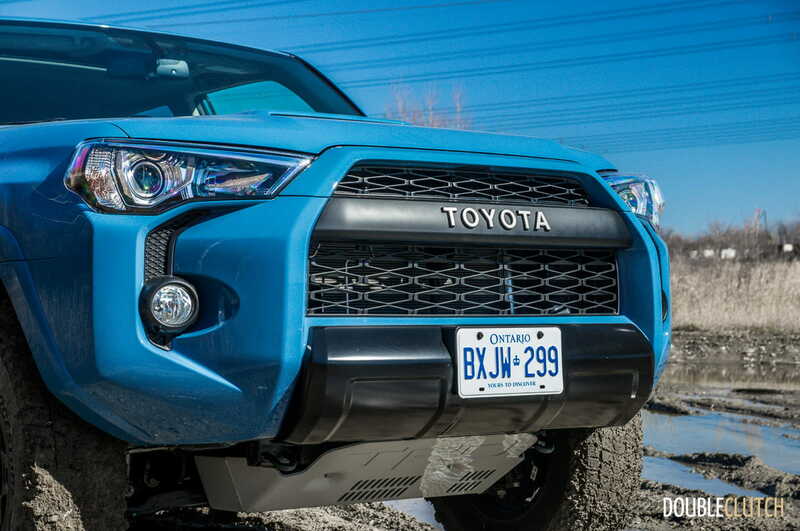 The front grille done up in “TOYOTA” script gives it a retro-cool look in a throwback to the 1980s and 1990s, and its overall bravado also approaches that of the dearly departed Toyota FJ Cruiser. 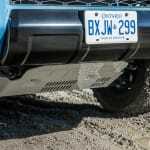 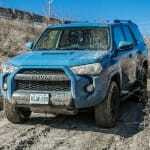 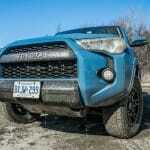 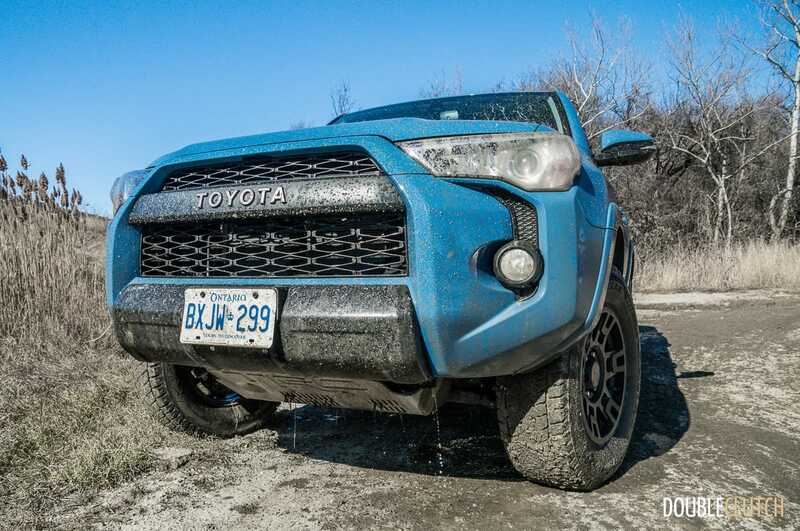 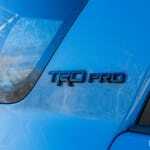 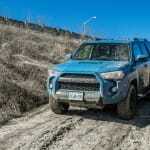 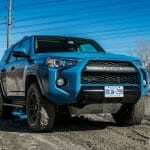 With Toyota Canada giving the DoubleClutch.ca Magazine team a chance to drive a brightly-painted Cavalry Blue TRD Pro, we got an up-close and personal look at how the Pro trim stacks up against the more pedestrian TRD Off Road version tested last summer (reviewed here). Like the TRD Off Road package, which is the second from the bottom, the flagship TRD Pro includes a lever-style four-wheel drive system. 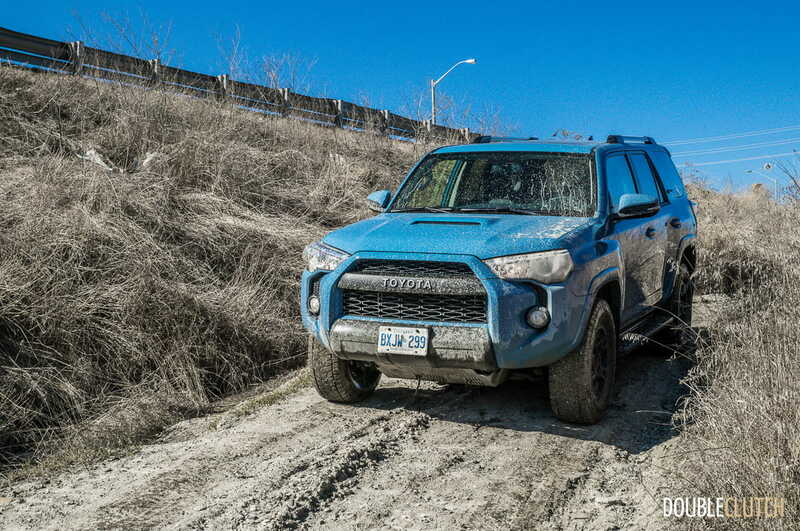 A 4-Wheel Crawl Control system is standard, which allows for automatic speed control on hill descents and rocky terrain. 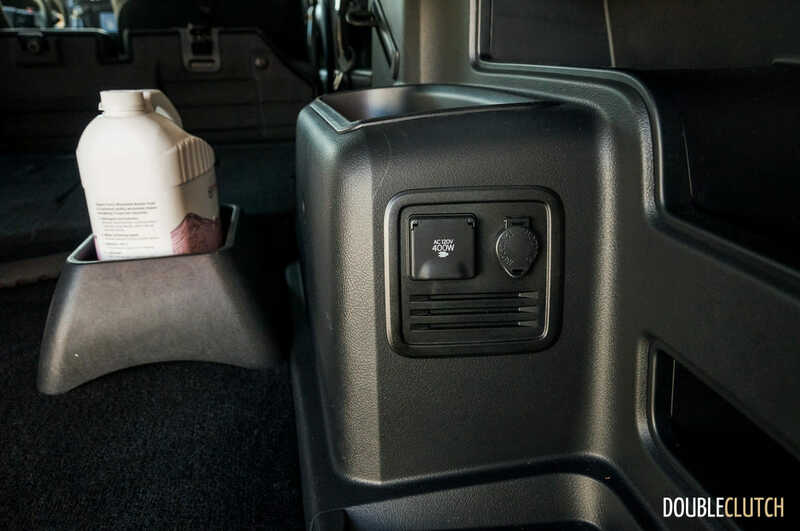 An overhead control dial allows for the selection of sand, mud, or rocky “Mogul” driving, and an adjacent button electronically locks the rear differential. 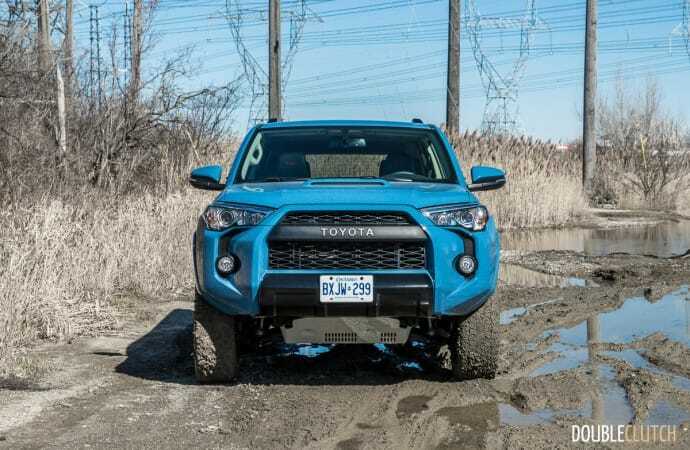 Underneath the body-on-frame chassis, there’s a double wishbone suspension up front with TRD-tuned front springs, and a solid rear axle out back. 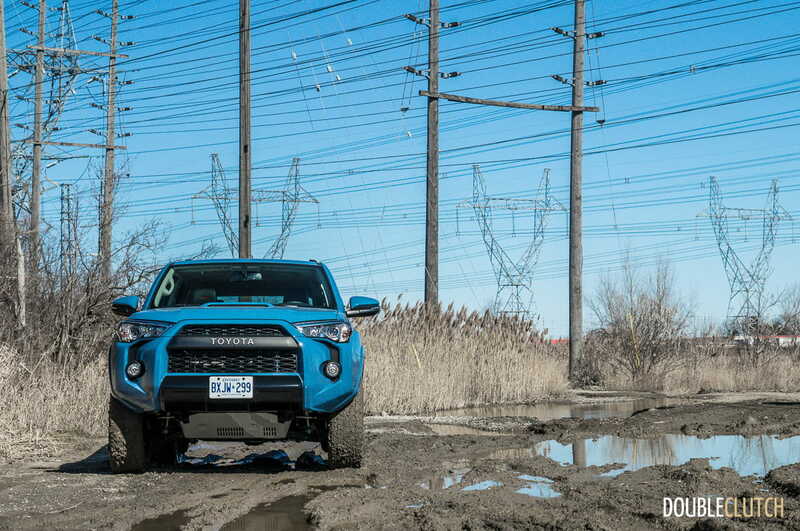 At all four corners, TRD and Bilstein have teamed up for high performance damping, and the rear shock absorbers have remote reservoirs. 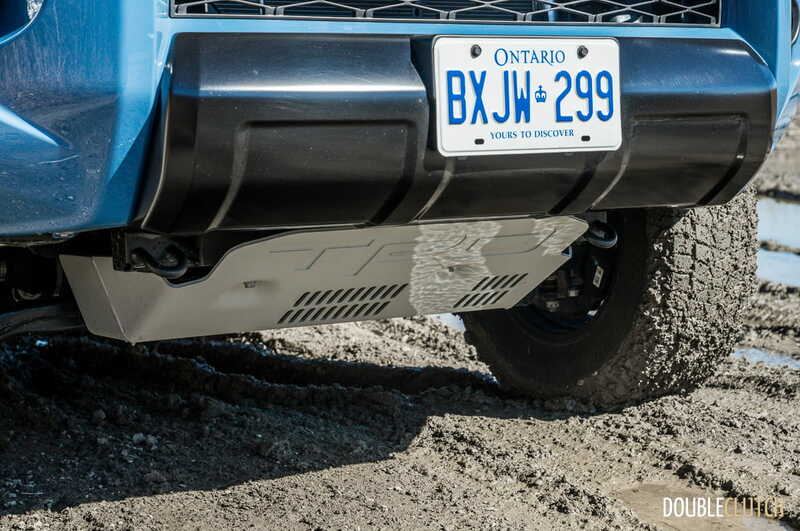 An aluminum front skid plate is added to the Pro, as well. 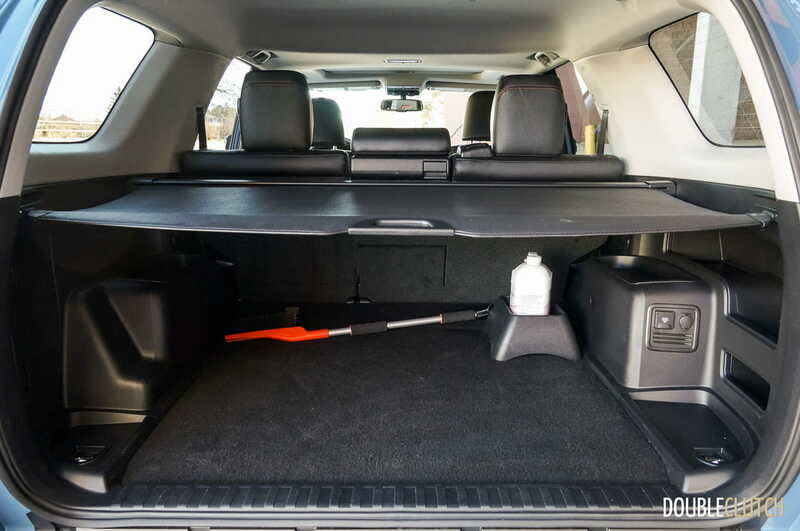 For those who like to tow, capacity is rated at 2,268 kilograms (5,000 pounds). 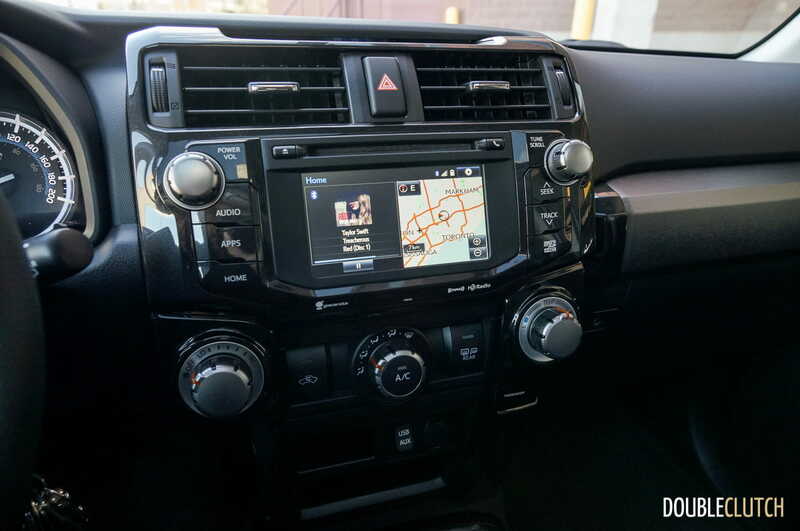 Inside, the TRD Pro is finished almost identically to the base/TRD Off Road car, as opposed to the more luxury-oriented Limited trim. 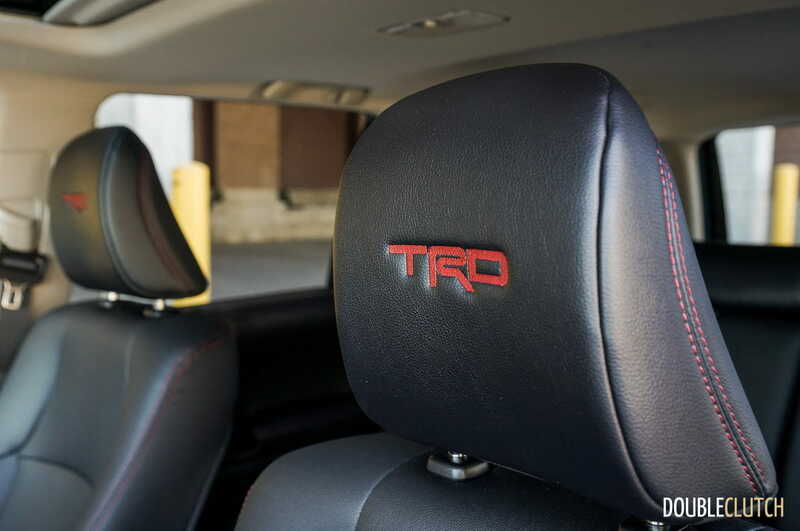 The seats are SofTex synthetic leather (feels the same, but is supposed to wear better), and have neat TRD embroidering on the front headrests. 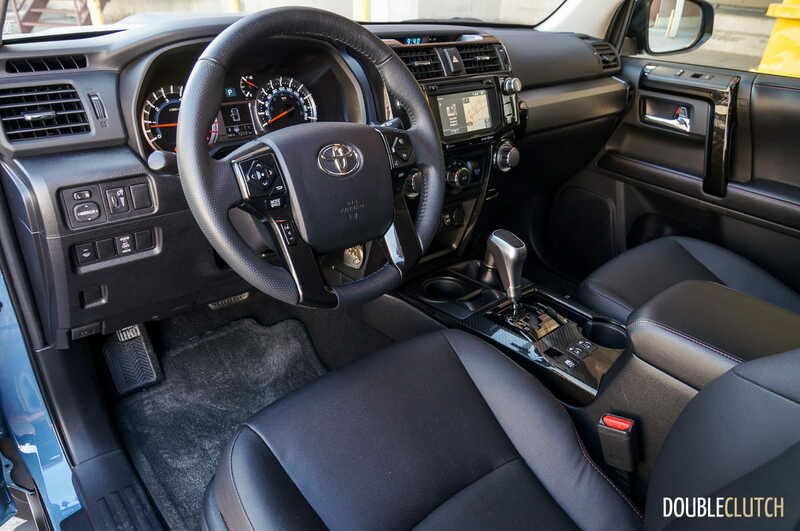 There’s also a unique shift knob and floor mats. 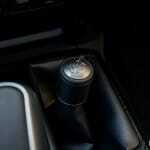 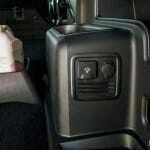 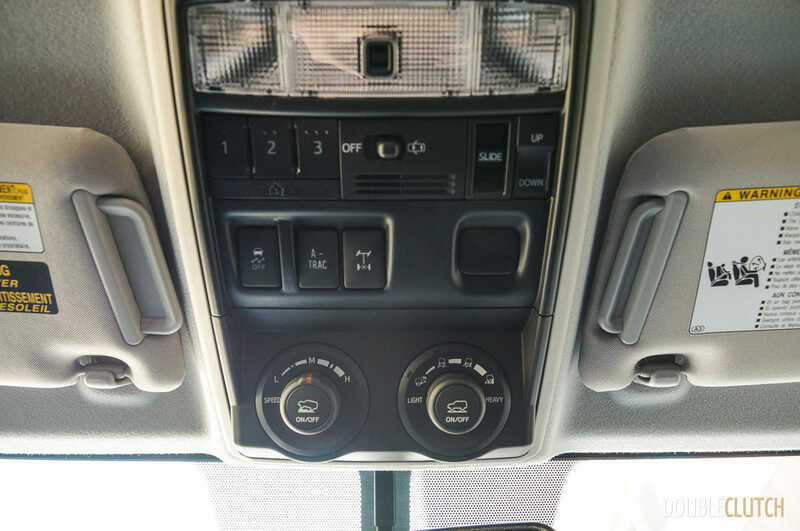 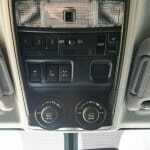 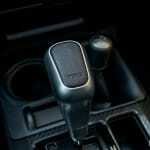 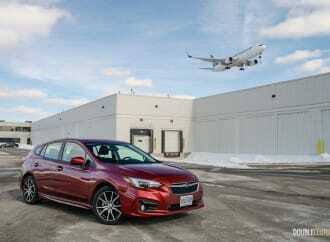 Navigation is standard, and climate control is done manually. 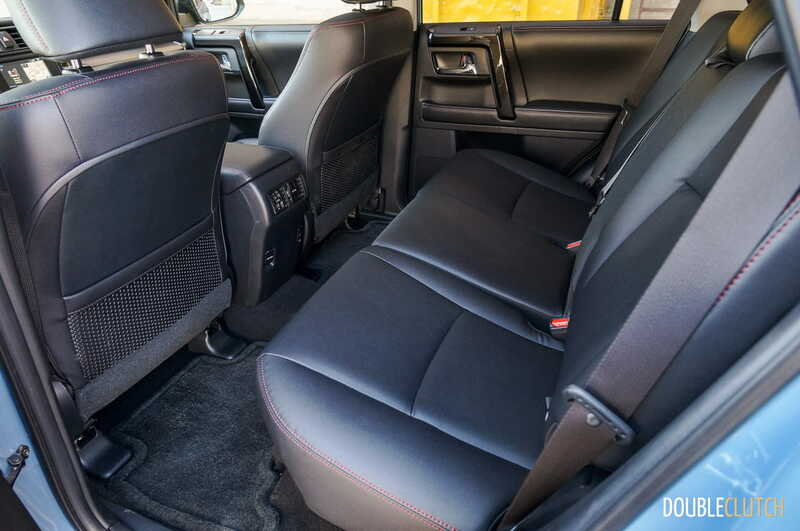 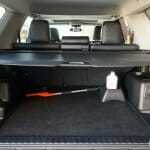 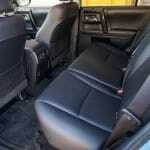 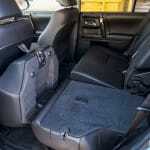 The rest of the interior is function over form, and is rather spartan, but gets the job done well enough. 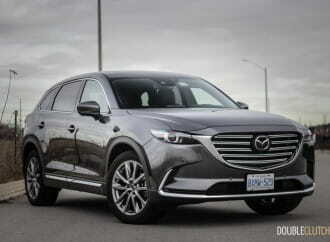 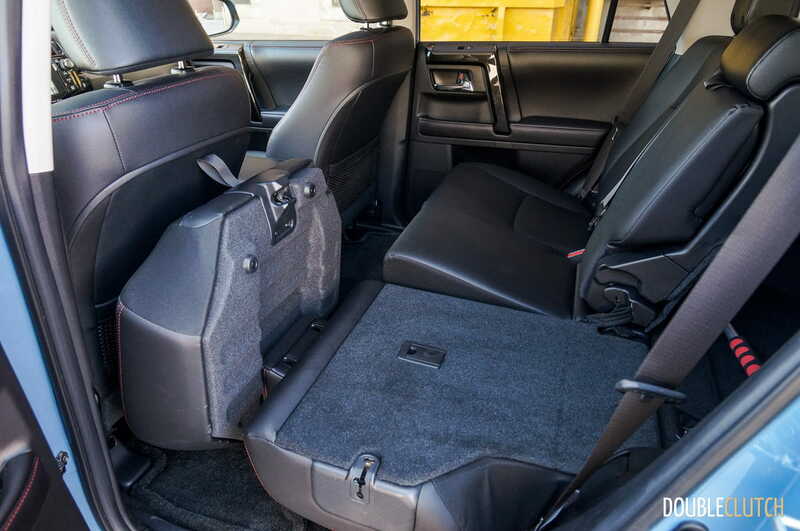 It’s put together to typical Toyota exacting standards, and it feels distinctively truck-ish in that it is not as comfortable relative to a regular car or crossover. 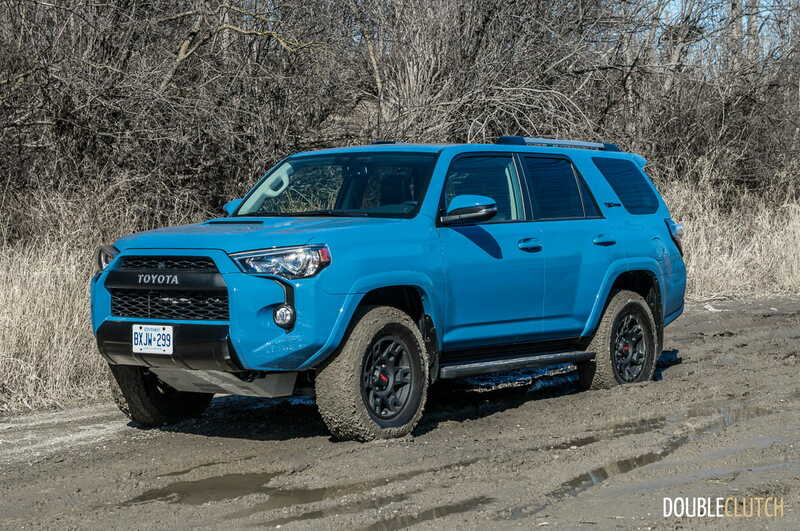 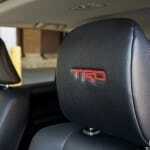 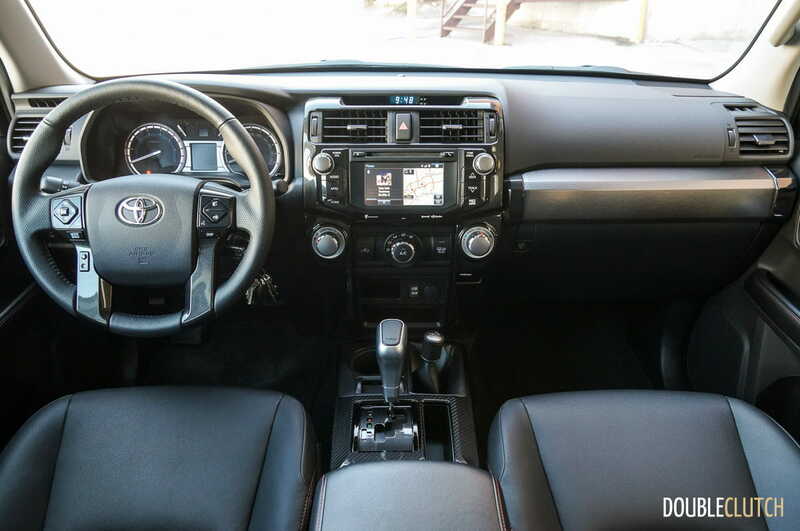 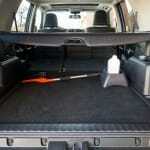 The TRD Pro should not be the 4Runner you buy if you are looking for more luxury. 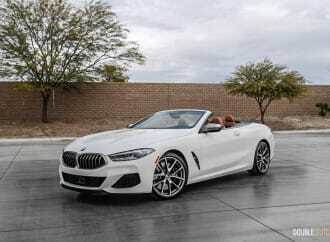 In that case, get the Limited instead. 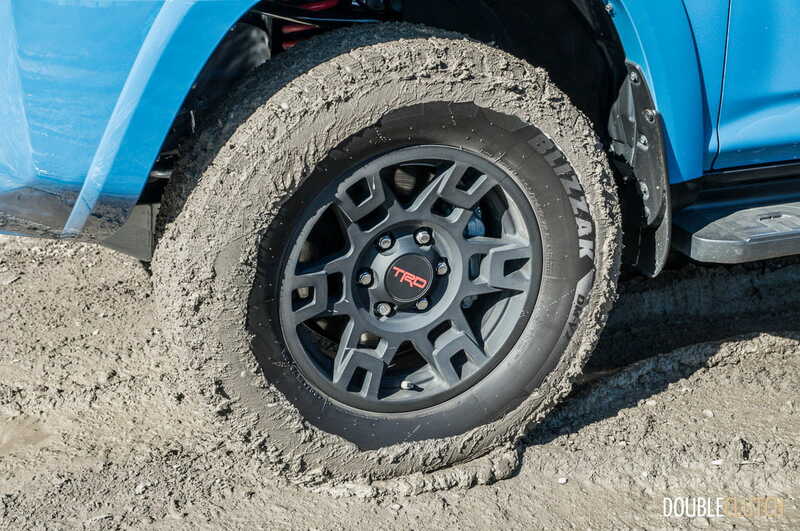 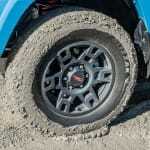 On the outside, the TRD Pro dresses things up with 17-inch matte black TRD wheels, complete with 31.5-inch Nitto Terra Grappler All-Terrain tires. 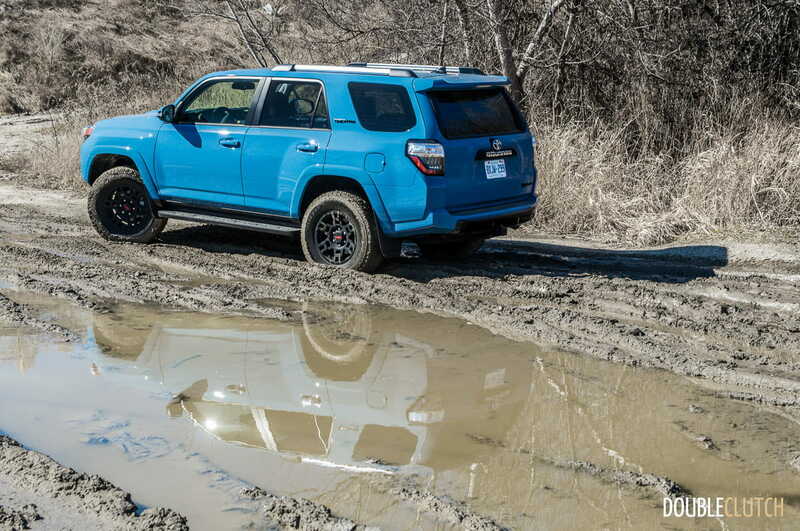 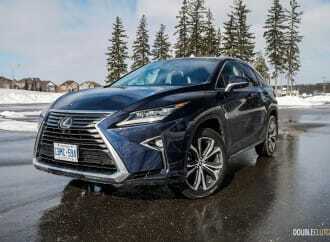 Although the tester was specifically equipped with Bridgestone winter tires for snow and ice, they were plenty aggressive enough for some mudding and puddle jumping. 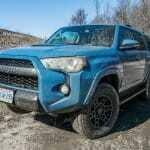 Curiously, TRD Pro doesn’t increase the 244 millimetre (9.6-inch) ground clearance of other 4Runners, and the remote reservoir shock absorbers delete the Kinetic Dynamic Suspension System, which hydraulically varied the front and rear sway bars for improved suspension travel during tough off-road conditions. 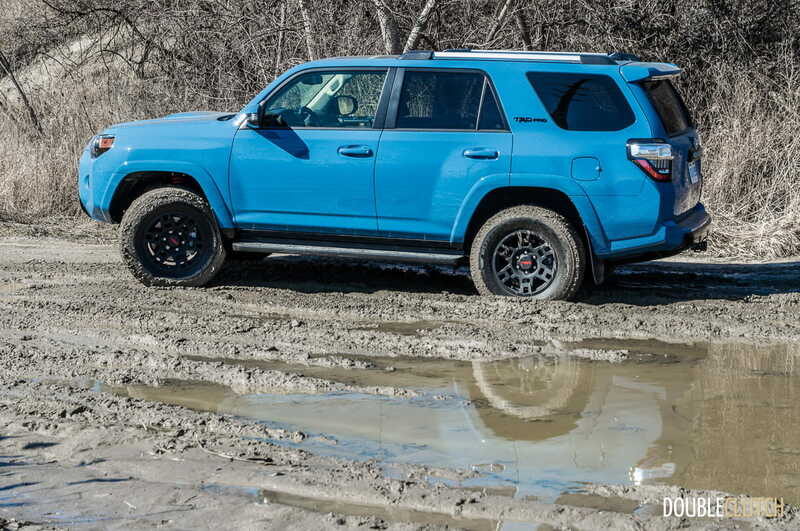 The improved springs and shocks alone appeared to do the trick however, and bouncing through deep mud ruts was no issue at all. 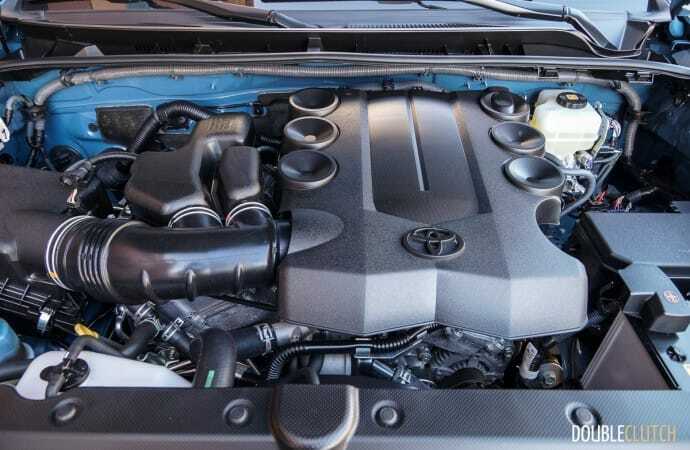 Powering all trim levels of the 4Runner is Toyota’s “1GR-FE” 4.0-litre V6. Having been used for the last fifteen model years and also in the old Toyota FJ Cruiser, it is a rock solid and dependable unit that provides gutsy response from the get-go. 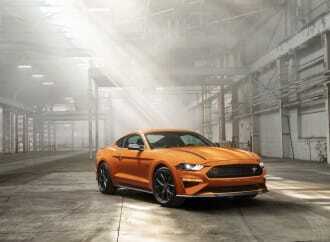 Peak output is 270 horsepower at 5,600RPM, and 278 lb-ft of torque at 4,400RPM. 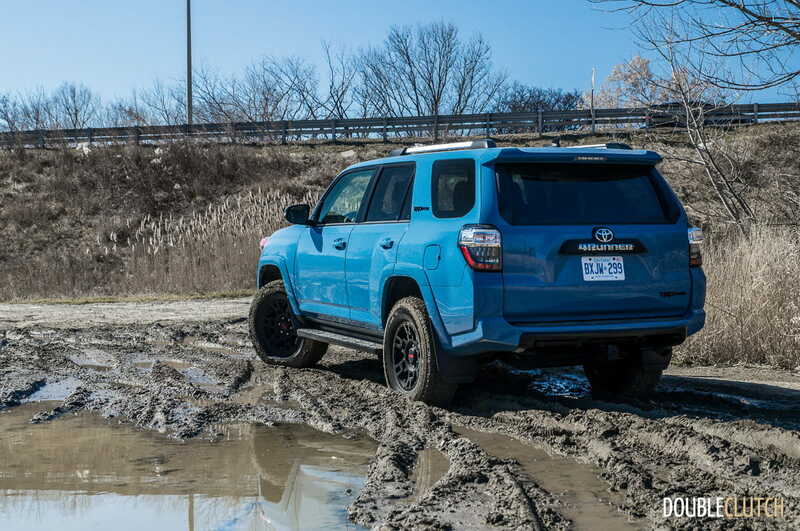 While the 4Runner won’t win any drag races, it makes power anywhere and everywhere throughout its rev range, and features an especially punchy midrange. 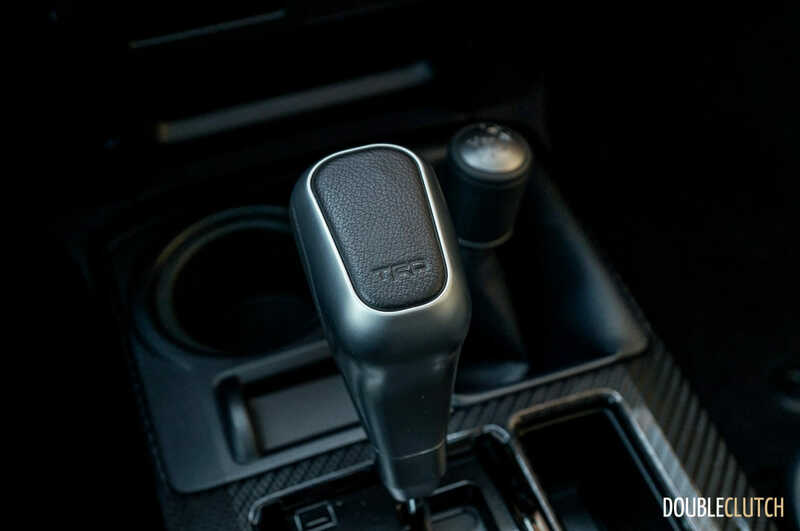 It does this all with great smoothness, and just enough gruff engine note to bump the testosterone levels by a notch or two. 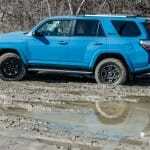 With an older design five-speed automatic transmission, the 4Runner doesn’t necessarily do well in the fuel economy department, but shifts are crisp and predictable, requiring an occasional kick-down from fifth when climbing hills on the highway. 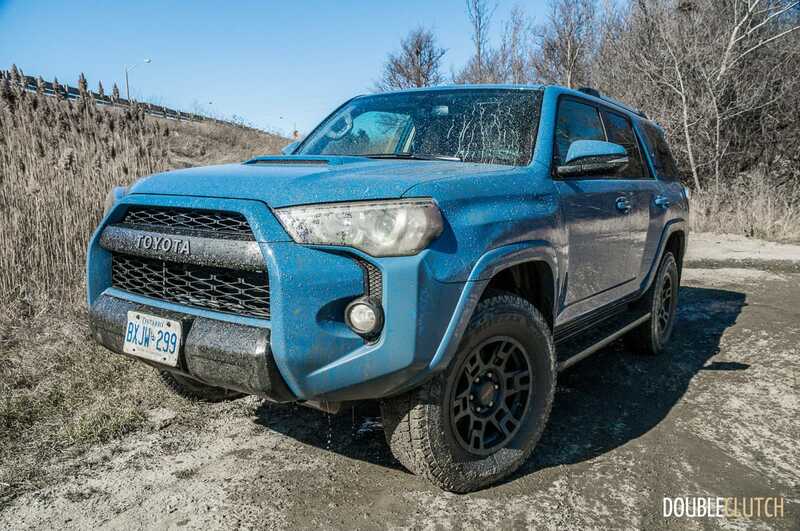 Rated at 14.3L/100KM in the city and 11.9L/100KM on the highway, observed economy came back at 13.8L/100KM during mixed wintery weather and combined with some off-roading. 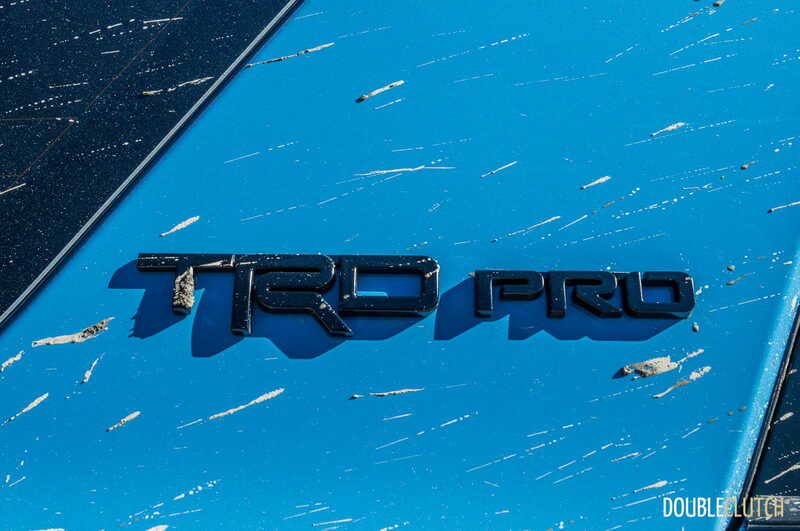 This isn’t particularly great, but likely won’t bother die-hards too much. 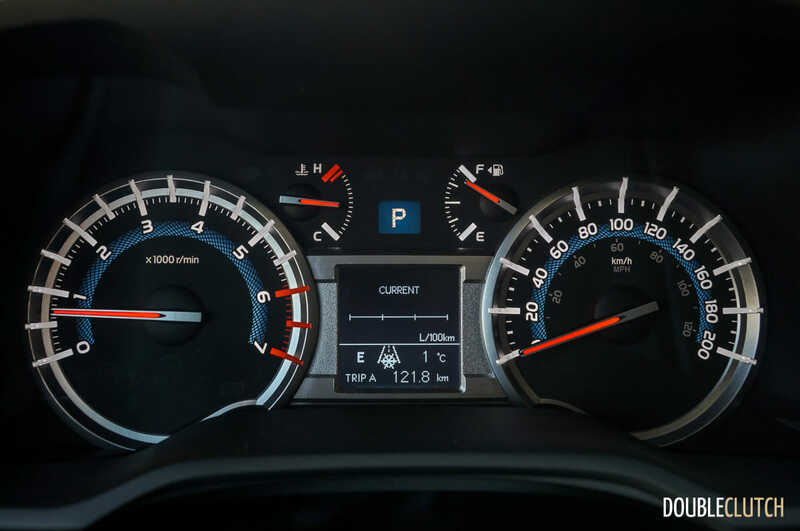 Fuel capacity is 87 litres (19.1 Imperial gallons), and regular octane is acceptable. 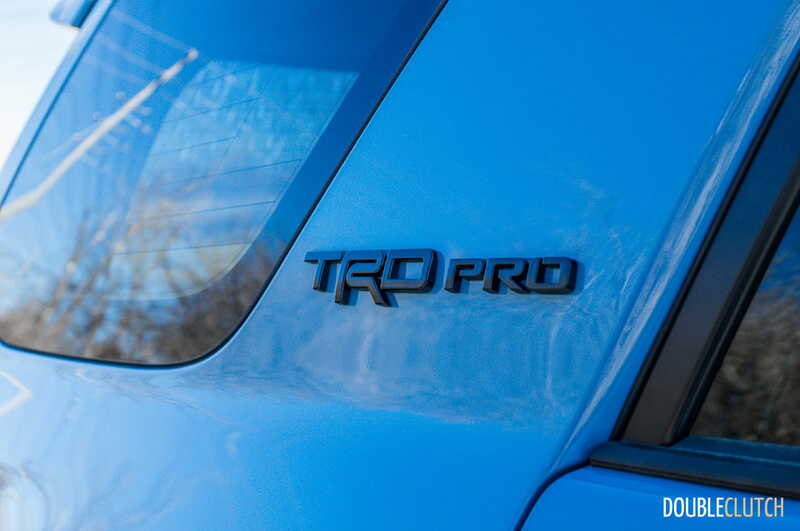 As a daily driver, the TRD Pro’s suspension package doesn’t sacrifice ride quality at all. 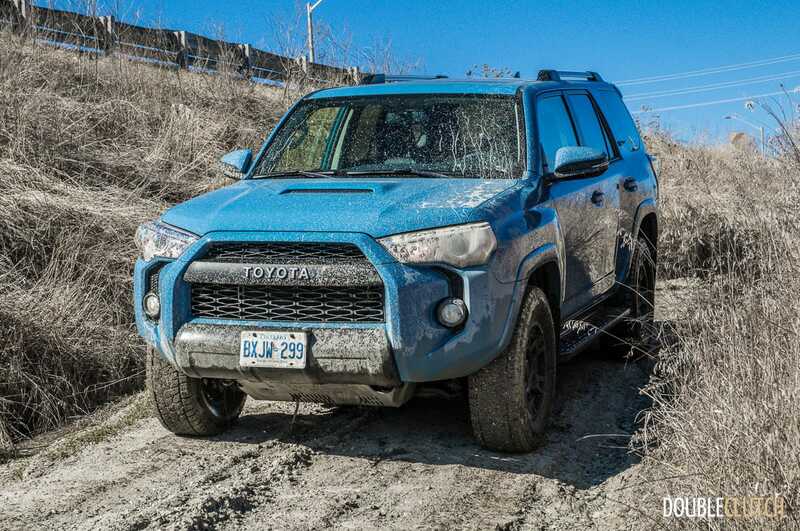 It’s very similar to what you’d find on the regular TRD Off Road spec, in that it isolates the highway beneath you quite well, and the crashing over bumps is as reasonably controlled as would be expected for body-on-frame chassis construction. 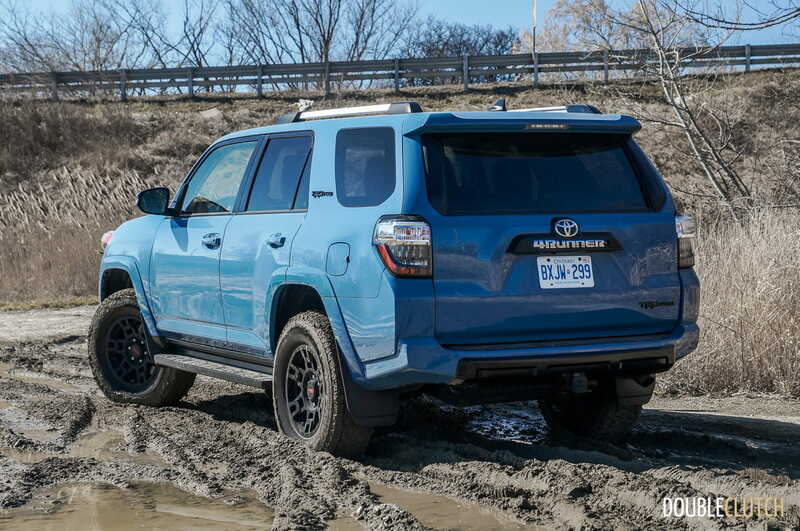 Road noise with the Bridgestone winter tires was well-controlled, but this may not be the case when equipped with the blocky 31.5-inch Nitto all-terrain kicks. 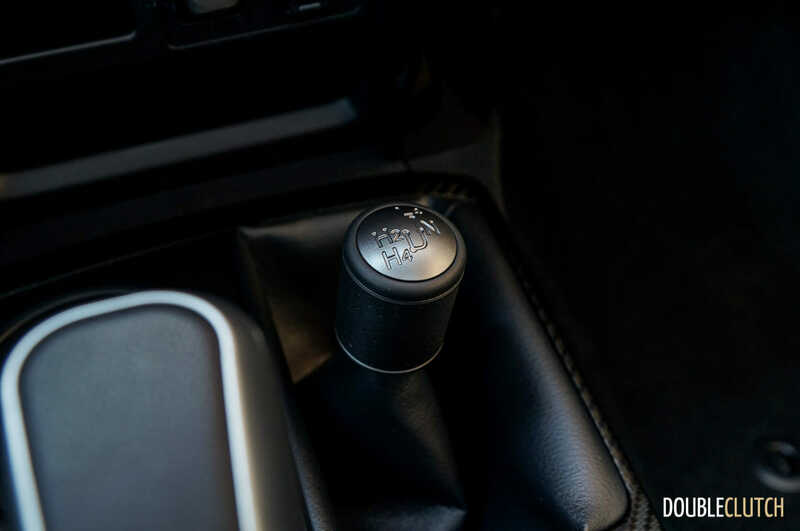 Like last year’s car, the brake pedal does feel quite long, and low-speed braking is still too non-linear. 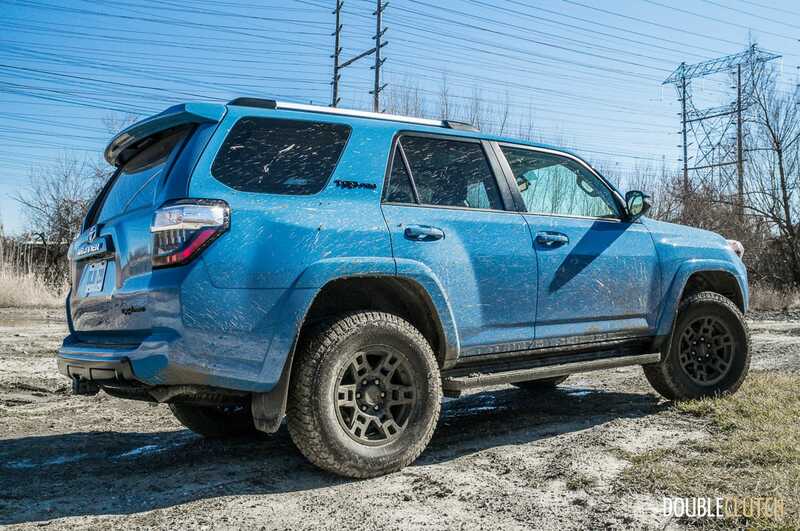 The 2018 Toyota 4Runner TRD Pro comes in at an as-tested price of $53,130. 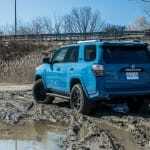 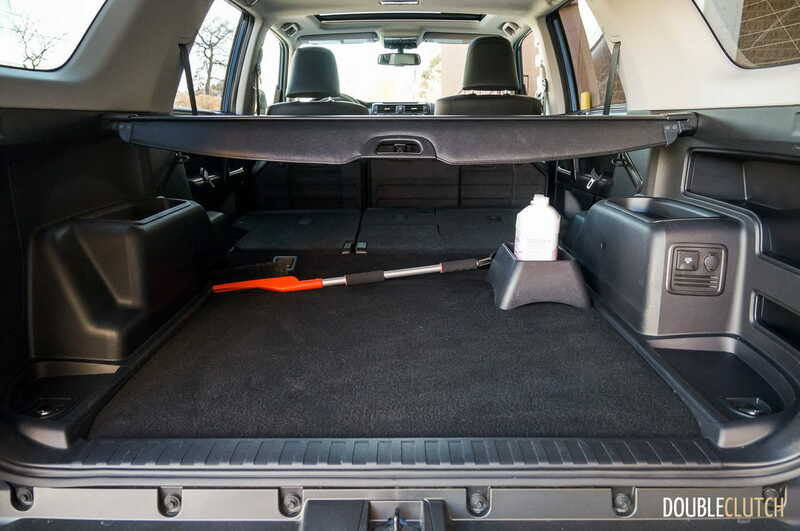 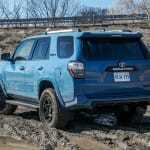 At this point, it still competes with the Jeep Grand Cherokee, which is a more comfortable vehicle inside and out, but doesn’t quite offer the body-on-frame ruggedness of the 4Runner lineup. 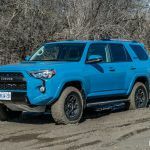 The TRD Pro ends up also doing battle with the macho-man (or woman) appearance of the Jeep Wrangler, in which a new JL generation has just debuted. 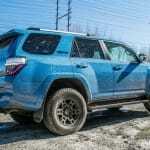 For the masses, with both vehicles capable of tackling on and off-road use without too many compromises, the Wrangler will likely be the more popular choice. 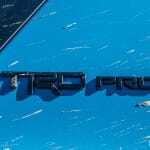 For those who know and love Toyota trucks, the 4Runner TRD Pro is a very sure bet. 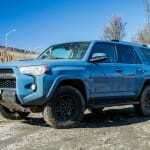 As a 2019 update, Toyota has called for a change to Fox-branded shocks, increased ride height and suspension travel, improved underbody protection, and added new roof rack and colour options. 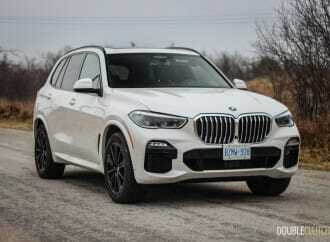 It might be a good idea to wait for next year’s model.